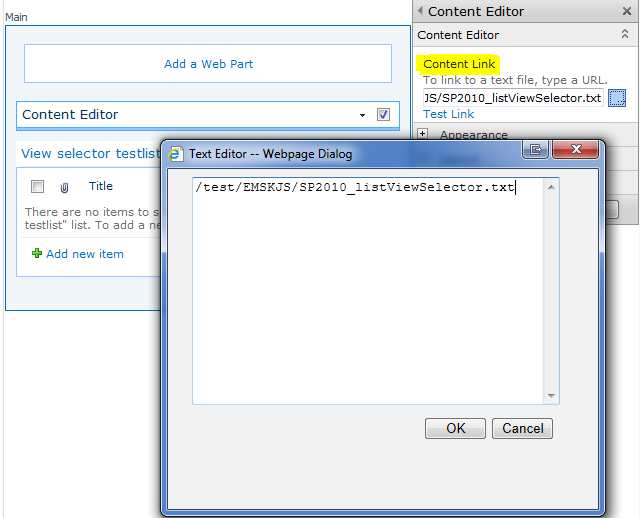 In SharePoint 2010 you loose the list view selector in a list view if there are more than 1 web part in the page. This makes navigating the list views very cumbersome. I have previously created a solution for adding a view selector in these list views, but that solution was a bit clunky. This is the first article where I’m using the “SharePoint 2010 Client Object Model”. This solution is placed in a ContentEditorWebPart (CEWP) somewhere in the page you want the list view menu re-enable in. I recommend using the “Content Link” option in the CEWP as the code might be messed with by SharePoint if you paste it directly in the CEWP’s HTML-source. You do not get any pictures of the menu itself as it is no different from the standard list view selector. Does Monkeysoft do things like this just to purposely annoy users? Perfect timing for me too! Just face this issue today. Still need to try on my dev server. But one more issue is that ribbon for list view webpart won’t come up if we have more than one webparts on list view page. So, any idea what we can modify/add to script to make this working? Glad you liked it. I’m not entirely sure what you mean by the ribbon not coming up. With more than one list view web part in the page, you need to select one list by clicking on it to bring up the ribbon. Thanks for quick reply Alex. The issue i am talking about, please check my blog for more details. Here i can’t upload images to give you proper explanation. Sorry, but I have no solution to this issue. The redirect from my old to my new server failed. I have updated the link. Have the master page been modified? I changed all the document.getElementById references but the error remains? Any ideas? I cannot help with a custom master page. Use the developer tools in IE (F12) and inspect the placeholder to find the correct ID to use. I am unable to get to the code. Could you update once again please? I’m not sure I follow you – does the link not work? I have tested it and it does for me. The link works. I am just used to seeing the code show up directly from the .txt file, and it’s blank for me now with an object expected error. I just did a “view source” though and saved it as a .js file. So, I’m good to go now. Thanks for sharing! No problem. This file is interpreted it as a web page and not as text, you should right click the file and select “save target as”. Many thanks Alexander – this works perfectly. I have spent a long time trying to find out how to get the view selector back. This is something that should be standard in SP 2010. Do you have any idea how to support folders? Currently it’s always redirecting to the root folder. I tried to append the rootfolder to the ‘relUrl’ but that doesn’t seem to fix it for folders. Hi Alex, many thanks for sharing. We were desperately looking such solution.